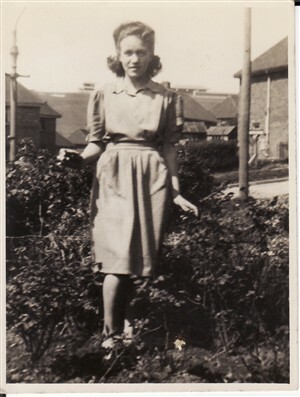 I am Hazel Bradley, nee Simpkins; I was born at approx 7am on the morning of 29th June, 1928. The midwife, plumping up the pillows for my mother, found a sandwich and told her it was not allowed that she should eat so soon after giving birth to a child. My mother's answer was "When you have had as many children as I have you will know how hungry you get!" I was the last child of this family. My parents had lost their first born, Irene, with diphtheria at age 3. They lost their only son, Freddie, also aged three and with diphtheria. I can still remember my Mother almost shouting at a School Doctor who was taking a spatula from a glass of what seemed like filthy water. "You won't need that, she can open her throat herself". I could - I did - and still can. 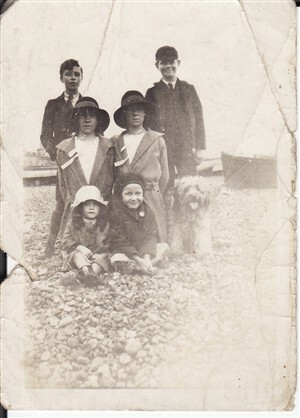 I started school in Upper Gardner Street, Brighton at age 3 and within 6 months could knit. The schoolroom had large pictures of things in alphabetical order. I can remember the red apple for A, a book for B and a cat for C. There was a very large open fire, surrounded by an equally huge fender. We were taught to warm our hands then rub them together over and over again until we had thawed out enough to work. I loved school. I am told that when I was about two I used to sit on the curb outside the house and sob every day when my sisters left for school. I always loved school, right through until I was fourteen when I started my first job in Central Stores, Allen West, Lewes Road, Brighton.. When I was aged 4 years, my Father, Mother, three sisters and I moved from 26 Tidy Street, Brighton to 3 Nuthurst Road, Whitehawk. My Sisters walked all the way pushing a pram full of necessities. Some of the way I was allowed to sit on the top but I think I did walk quite a few miles. When we arrived we found a hot cross bun on the mantelpiece and we soon ate this between us, while we waited for our Mother to arrive with the removal van. Our next-door neighbours were Mr. & Mrs. Barcock. The neighbours on the other side were the Tulleys. Mrs. Tulley got very cross when we chalked hopscotch squares on the pavement. She also complained if my Mother lit a bonfire in the back garden. She would reciprocate but only when we had washing hanging on the clothesline!! My Mother had a very loud voice and the rows could be heard inside the house with all the doors and windows closed. As the Whitehawk school did not take children under 5 years I had to wait for many months before I could attend. My mother worked so I was fielded out with a very large round lady who lived in Whitehawk Road in a "Jesus" house, so called because they had sayings from the bible etched over the doors. I did not like this lady and I guess by the time I started school she didn't like me either and must have felt she was underpaid for her efforts. I can now feel compassion and in retrospect I think the fact of not being able to go to school was the main problem I had. I attended the Whitehawk infants and junior schools and praise be passed the 11-plus exam. which would take me to the Intermediate School in London Road, Brighton. More of this later. I am sorry to say that this story will be intercepted with little cameos of memories, which will not stay out of the whole picture - here is another. We played marbles on the way to and from school, along the edge of the verges. I was very, very good at playing marbles because I had to pay a boy 6 marbles to borrow one of his roller skates for the dinner hour. I had only one skate (cost three pence), which I was not allowed to use by itself as this would wear out the shoe on the other foot! We had very little money, along with all the other people with whom I was in contact. I can't think why the boy needed so many marbles - evidently not much good at flicking them! I had a friend who lived about 5 or 6 houses away. She was a well-built girl and I was the skinny underweight runt of the family. We were called Laurel & Hardy. If I overstayed my allotted playtime my Mother would call my name and even if we were in Eileen's house we could hear her call "Haazeell". As I said, she had a very loud voice. My sisters (except my eldest sister who had a boyfriend with a tandem) had bicycles and they both had accidents. One of who was unconscious for a week. When I was about ten my Mother said I could have a bicycle when I could ride one. Thinking no doubt that as I did not have one I would never attain that skill - but - I had friends and after lots of falls, and many hours I did manage to ride a fairy cycle (it was red). I proudly called my Mother to come and see something. I gave a demonstration of my newly acquired skill by riding along the road and actually turning round in the road just outside our house. When I asked Mum if I could now have a bike, she said No, your sisters have all had accidents. I was mortified not only because I had spent so much time and effort in learning to ride but because I had bragged to all my friends that I would have a bike now that they could borrow . Unfortunately because the Warren Farm had been taken over by children of London schools evacuated at the beginning of the war and some of these children were educated at the Intermediate School, our (my age group) transfer was delayed by (I think) a year. This meant that I had to spend a year at the Whitehawk Senior School where showers had been installed. After every PE session we had to strip and walk through these 6 or 7 showers, turning around on the spot at each one. At the end we were each given a towel and had to dry the back of the girl in front then give her the towel so she could continue to dry herself. All the time the teachers watched us and I found this to be humiliating. I really don't know what I would have done if I had not passed the 11-plus. The question I put to my sister on my first day of PE was "do they have showers at the Intermediate"? We had to carry all our belongings with us each day and had our classes every afternoon in various premises around the school. St, Peters Church, the Dining Rooms in Cheapside, etc. as the Warren Farm children still occupied our school for half of every day. Inter did not have a sports field and we held our sports at Varndean School. A few of us walked back, spending the bus fare to buy cakes (sweets were rationed), or currants, or sultanas. I did the same with my bus fare home each day. Another delight was desiccated coconut, which was available without coupons. We had three gardens as we lived in a semi-detached house on the corner of Nuthurst & Fletching Roads. The front and side of our garden was surrounded by chest-high privet hedges, always neatly trimmed. I had the job of picking up all the trimmings. When I was older I was allowed to cut the hedges but still had to pick up the debris.. The front garden was a rose garden with all colours and types of rose, bush, tea, to name just a couple. The back garden was set out in sections. Nearest to the house was a patch in which my Mother grew flowers, kept chicken, (the rabbits were kept on the path beside the house) The next section was laid to lawn with a huge gypsophila bush. and two small apple trees (it was here we held our "Rainbow Concerts". So called because my Mother had sewn a large arc of strips of gathered crepe paper in the colours of the rainbow onto a large white sheet which was hung behind the "stage" (the garden path). We started each show by singing "Somewhere over the rainbow". And had movements to illustrate the song. Very beautiful to us, but probably horrendous. We then played out little sketches and sang songs. One of which was "Daisy, Daisy" with my sister Daisy who held the bicycle (made for two). Each child paid a penny and received a drink of lemonade and a garibaldi biscuit; yes the ones with dead flies in the middle. The money was collected and when we had a reasonable amount we took it to the Royal Sussex County Hospital for goodies for the war wounded. The soldiers wore blue suits, presumably to ensure they were known to be wounded soldiers and not conscientious objectors. The next section was set out with potatoes, cabbages, sprouts, peas & beans etc. until Dad had the allotment for these products. After this he buried two foot long pipes filled with good soil and planted one carrot in each, producing beautiful large 18" long carrots. Parsnips were grown in the same way. His onions grew to about 5" in diameter. He was an amateur gardener, and entered competitions each year. I remember him now cleaning the potatoes with a cloth dipped in milk, tying the tops of the onions with raffia. Selecting tomatoes and vegetables to get the allotted amount for each section of the Competition exactly the same size, in perfect condition. The carrots had to be the same length and were exhibited with the leaves attached. All this had to be transported to the exhibition and arrive in perfect condition. The last section at the top of the garden was set with a Greenhouse (tomatoes and cucumber) and two huge glass frames (lettuce and seedlings). The greenhouse was my Father's retreat and he would spend hours there, I think to get away from all the females. He would spend hours with a rabbit foot fertilising the tomatoes. In 1946 my Father won a cup at the Food Production Competition. He also won £3, which was put into a savings account for me, to teach me the value of saving money. I think that all I learned was that if you put money into savings you could not spend it. This was the only money I had for many years. My father made our gardens beautiful, working so hard to change the chalk into growing soil. I remember once when he had a lorry load of manure delivered. It was left on the road outside the house and it was our job (my sisters and me) to carry this, bucket by bucket, to the back garden. It was a chore but we knew that this would give us good vegetables to last the year round. I was also given the job of carrying home any manure dropped by the various horse drawn carts; the Rag & Bone man who gave us birds in bright colours which had long tails that made a swishing sound in the wind; Mr. Robinson who had a greengrocer shop and delivered all round Whitehawk with his horse and cart. We hardly ever bought anything from him but he was very welcome to drop a load of manure outside our house!! Eventually my Father rented an allotment at the end of Nuthurst Road where he grew all the vegetables for our family. My Mother never bought vegetables. I remember sacks of potatoes put away to last out the year. I was given a small patch on the allotment to grow flowers. I felt so proud when my seeds grew leaves and eventually flowers. I had some idea of how my father loved gardening, and producing food for the table, especially in wartime when things were rationed. We always had good food. He also looked after the garden for the Sulleys who owned the grocer's shop in Whitehawk Avenue, near Lintott Avenue. He was just a little man but he worked all three of our gardens, and the allotment. One Saturday night it rained, and the night was so cold the rain froze on the pavements. Daddy went to the allotment (with old socks over his boots) and brought back some vegetables. I can still see the cabbage, it was a Savoy and each leaf was covered in its own casing of ice. I had never seen anything so beautiful and wanted to go to the allotment to see all the other plants but Mum would not let me, as the ice was treacherous. I remember two boys were ice-skating down Whitehawk Avenue on the pavement. It is strange but I can't remember feeling cold on that day. I was in awe of everything. Every leaf of the privet bushes had its own ice cover. A day I will never forget. This page was added on 29/01/2008. Hello Hazel,That was a lovely story about your time in Whitehawk. My maternal grandmother lived in Nuthurst although I'm not sure of the number.Her name was Alice Pattenden.I would sometimes stay there as a child when my parents needed a baby sitter. 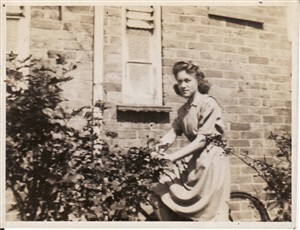 My parents moved to 7 Wiston Close in 1947 when I was around one year old.We lived there until 1958 when we moved to Australia. I seem to remember a police station and phone box near the corner of Nuthurst Rd, but the memories are a bit vague now. If you have any more photos of the area,I'd love to see them. The one where you are 16 is great, even though I don't recognise you, I can see the houses and the race course in the background. With reference to the Hazel Bradley message re: mr Barcock being killed in a sub-station explosion,this is totally wrong as I am his son and used to live at No1 Nuthurst.I remember Ivy Simpkins also.My father was badly burned in the explosion and spent two years in Hurstwood Park Hospital,he died in 1975 having contracted cancer. I would like to know if Daisy was the Daisy i knew of as my great great grandmother, she went on to marry Ted Brown, and then had my grandmother Rosy Brown,married as Boyce and had my mother Jaquline Brown/Boyce. They have all passed away now and still miss them dearly. Finding all these storys here are a true gem and would love to hear more. 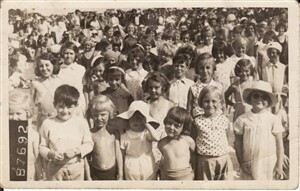 I was very close to all these women while i was growing up and in the photo of keeping fit on brighton beach im very sure its either my g.g.grandmother Daisy or my mother Jackie Brown in the crowd, they were so alike and it could be either of them. 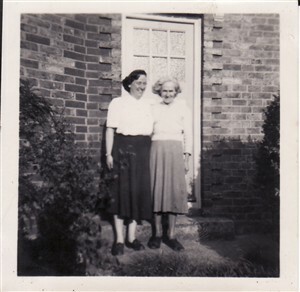 Anyone with more info or photos please get in touch, i also have many photos taken around the 1940s and 1950s of my family. Hi Paula, As a kid I used to play with a Jackie Boyce who lived opposite me at 20 Manor Road. Her Mum was Rosy Boyce. She loved to go dancing. Is this your family? Hi I used to live on nuthurst road in the 50's with a family called Lorman who had 2 sons called robert and roy. Do you know them and their whereabouts, as it would be nice to get back in contact with them. Yes Marion Jackie was my mum and Rosie was my nan, she passed away 4 years ago. I used to stay with my nan in Manor Road every weekend as a kid. Hi my name is Bob, I lived at No12 a two bedroom house with my mother, father, two brothers and sister from about 1951 until we moved in 1964/5 up into 22 Twineham Road a three bedroom house. My sister got older and needed a bedroom of her own. My father was the group scout master in Whitehawk for many years. My mother was the school cook for many years at the Whitehawk Schools dinning halls, one kichen serving two dinning halls serving all three schools. She once said they served almost a thousand meal some days. I too learnt to ride a bike on the estate but never got one of my own. I had a good time living in Whitehawk and made many friends there. I have been back once since I move out in 1969, I looked down into the valley from the race hill apart from the bottom end of the estate the rest did not look anything I remembered or look like home to me.